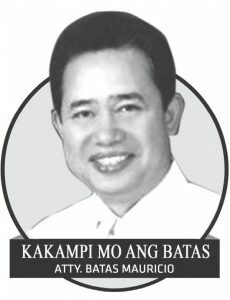 One question that hounds my mind following the statement by Renato Payuman Llenes, the 42-year old man who confessed to killing 16-year old Christine Lee Silawan last month in Cebu, is have Filipino youth become so irresponsible that, despite only knowing a person through social media, they agree to meet with them? In his testimony to police, Llenes said, after exchanging messages on social media, they agreed to meet. During the meeting, while under the influence of illegal drugs, he reportedly grew incensed with Silawan’s admission of no longer being a virgin, which prompted him to repeatedly stab her with a pair of scissors. The killing was truly heinous and gruesome but, as far as I am concerned, failures by the girl’s parents to exert control over her actions were even more heinous and gruesome. At 16 years old, she was too young to be communicating and meeting with just anybody. She was also too young to accept a friendship with a man she wouldn’t know from Adam. Clearly, her parents failed in their duties (assuming they are still alive) by not teaching good manners and right conduct, particularly when it comes to befriending strangers – such lack of instruction ultimately proved to be Silawan’s undoing. Parental failure to guide and instruct children on proper behavior affects the entire country today. Whether from well-to-do or impoverished households, young people share one common trait: They have not been trained to do good deeds, along with having faith and love for God. However, parents are unable to teach these subjects since they themselves were not instructed on such topics. Across the country, a grossly different kind of child has emerged: the entitled. They believe the world owes them everything they desire – a far cry from the children of my generation, who, after a mere stare from their parents, toed the line. These “entitled” children are growing up face and, in a few years, they will replace my generation. What kind of future awaits them? What happens when a greater number of citizens are rude, self-seeking, and only concerned with their interests? Can something be done? Believers in God and the Bible must be strong in their faith and insist on the relentless study of God’s word. One soul at a time, starting with ourselves, because this is the kind of truly beneficial change needed – a change rooted God’s word and not changing promises, especially from politicians.